The movie uses the flimsiest of plots as an excuse to string together astonishing action sequences in which Chan exhibits the physical grace and athletic control of a Buster Keaton. The rhythm of the movie becomes predictable. There's perfunctory dialogue (involving the disposable plot), bad guys appear, and Chan springs into action. He uses the martial arts to defeat whole gangs of thugs, yes, but he also uses whatever tools and props are at hand. In "Rumble," there's a sequence where he uses refrigerators, another one where he improvises with furniture, one involving perfect timing with a knife and another fight - in a grocery store - where he does something amazing with a grocery cart. 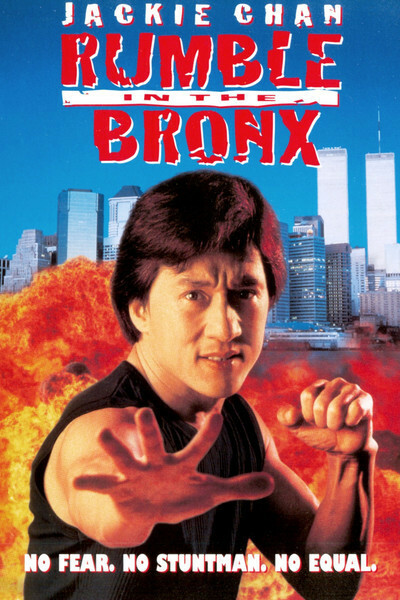 Jackie Chan is famous for always doing his own stunts, and his fans wait eagerly for the end of his films, because they know that along with the closing credits they'll see outtakes of the stunts that went wrong. "Rumble in the Bronx" has its share. There's one scene where Chan jumps off the top of a building and lands on a fire escape landing across an alley and two or three floors below. He broke his ankle on that one. In the outtakes, we can see ambulances arriving, blood spreading, and lots of laughs as Jackie hides a cast under his blue jeans for the next day's shooting. But it's not the stunts themselves that make "Rumble in the Bronx" special. It's Jackie Chan's high spirits and infectious personality. Here's a Chinese man, about 40, who resembles nobody so much as Tom Hayden, and whose nose looks as if it is broken regularly. He's pleasant but not handsome, athletic but not tall, and his acting in this movie is perfunctory; he's waiting for the action like the rest of us. He doesn't view himself with great solemnity. He gets the joke. And he seems to be enjoying himself. George C. Scott said a sign of a good actor is his ability to project "the joy of performance." Chan breathes that joy. There's a lighthearted air about "Rumble in the Bronx" that's infectious, if you open yourself up to it. Not that this is a masterpiece. The movie is just plain goofy. It's set in the Bronx but was photographed in Vancouver. Its Bronx has a golf course with mountains in the background. After scenes that are obviously not set anywhere near New York, it throws in a canned shot of the Manhattan skyline, as reassurance. And the plot (Jackie visits his uncle, helps him sell his grocery store, then befriends the young woman who has bought it) is simply a clothesline for the stunts and action. There's unintentional hilarity in the motorcycle gang that supplies the villains for the first half of the movie (before becoming Jackie's allies against the real bad guys). They look and talk like "Baywatch" rejects. In one scene, they fake an assault on a young woman (Francise Yip) simply to lure Jackie into a trap. They beat him to a pulp. Later, after Jackie has befriended Yip's little brother, who is wheelchair bound, she admits, "Sometimes we go too far." Meanwhile, the other bad guys think stolen diamonds are hidden in the cushion of the wheelchair. And so on. Any attempt to defend this movie on rational grounds is futile. Don't tell me about the plot and the dialogue. Don't dwellon the acting. The whole point is Jackie Chan - and, like Astaire and Rogers, he does what he does better than anybody. There is a physical confidence, a grace, an elegance to the way he moves. There is humor to the choreography of the fights (which are never too gruesome). He's having fun. If we allow ourselves to get in the right frame of mind, so are we.